Jon Butler’s work is on display at the Sudbury Arts Council’s ArtSpace at the South End Library until the end of August. Jon Butler has lived Willisville since 2001. The former newspaper publisher, originally from Kirkland Lake, stepped away from the corporate world and has devoted himself to his photography and the promotion of the arts since his retirement. Self taught, Butler likes to get up very early in the morning to capture first light of day with his Nikon D80. He shoots with natural light. He like the colours of the morning sky. He has published two books: Visions of La Cloche, Contemplating La Cloche with Words, and La Cloche Spirit; Contemplating Beginner’s Mind. 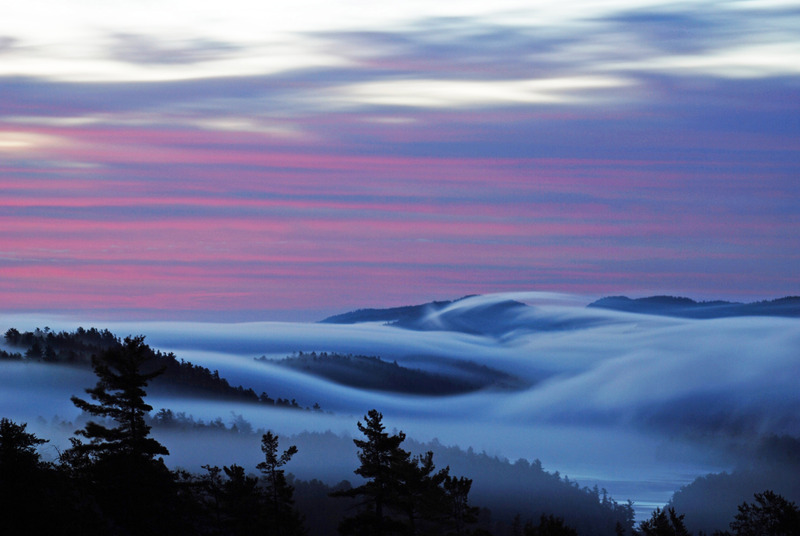 An exhibit of his work, La Cloche Spirit: The Equivalent Light, was exhibited at the Living with Lakes Centre last fall. Butler will have an exhibition this July and August at the South End branch of the City of Greater Sudbury Library. He and his wife, Kerry, are founding members of the La Cloche Mountains Preservation Society and the Willisville Mountain Project, dedicated to preserve Willisville Mountain and the beauty of La Cloche. Butler is also a member of the Art Gallery of Sudbury’s board of directors. Photographer Jon Butler has visited the “bell” rocks, now located on private property, and says the sound they make is amazing. The first major Canadian artists to capture the spectacular beauty of the La Cloche area were J.E.H. MacDonald, Arthur Lismar, Franklin Carmichael and A.Y. Jackson. The Group of Seven painters put La Cloche on the map in the days when the only access to the area was by rail. The gleaming white quartzite hills and surrounding beauty has inspired artists, photographers and musicians ever since. “There are about 100 major canvases and hundreds of small sketches of this tiny area” by members of the Group of Seven,” says Butler. A few years ago folk singer Ian Tamblyn recorded a CD of songs inspired by his visits to the area. The first La Cloche Art Show was first held in July 1978 at the Willisville Community Centre. Work by hundreds of Sudbury and area artists has been exhibited at the show as well as work by Frederick Banting, Robert Bateman, Norval Morrisseau and Ivan Wheale, who was one of the show’s founders. The show has been held at the Whitefish Falls Community Centre since 1993. Whitefish Falls is located halfway between Espanola and Little Current on Hwy 6. Art patrons flock to this art exhibition every July because they know they an opportunity to buy awe-inspiring art at affordable prices. It is also a lovely area to visit. Artists are invited to participate in the 36th annual La Cloche Art Show. The deadline for submission is June 14.